If you remember the story of Jack & the Beanstalk, you'll remember that it teaches us to literally go for the gold. Jack climbs the beanstalk to steal a golden harp from the giant. Then, his family is rich and happy forever. College is a time for preparing yourself to make your dreams come true. That's why this Jazzy Jacobean - Peel N Stick Dorm Decor college decorating accessory should be on your dorm room decorating ideas list. This Jazzy Jacobean - Peel N Stick Dorm Decor will remind you that no matter what anybody says, you should stick to your convictions, be courageous, and climb up until you get your golden harp of success. It's the only way to live. This Jazzy Jacobean - Peel N Stick Dorm Decor is an easy dorm room decorating idea and makes a great college gift for college students. Peel N' Stick dorm products do not leave a mess or damage dorm room walls. They simply stick on and peel off at your will. 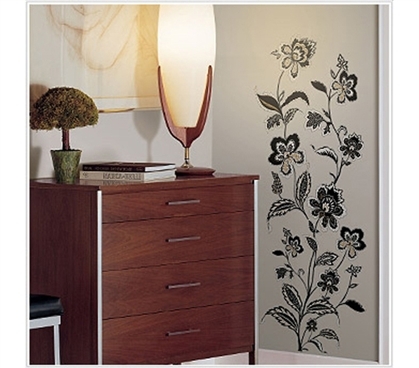 Add this Jazzy Jacobean - Peel N Stick Dorm Decor to your college shopping list to enjoy cheap dorm room decor.